Tragedy struck yesterday in Idoani, the headquarters of Ose Local Government Area of Ondo State, as armed robbers attacked a first generation bank, killing seven persons and carting away an undisclosed amount of money. It was gathered that the bandits stormed the bank located at Isewa Quarters in a Sports Utility Vehicle (SUV) and operated for over one hour, creating tension and panic among residents, staff and customers of the bank. The Guardian learnt that some customers and bank officials were mercilessly beaten and tortured by the bandits, while efforts made by personnel of the Nigeria Police Force to stop the attack were not successful. The bandits had gained access into the bank by breaking the security door with a substance suspected to be dynamites. Social and business activities in the town were also paralysed for several hours as human and vehicular movements stopped while the robbery was going on. Residents of the town were said to run helter-skelter for safety to avoid stray bullets. Some sources in the town revealed that the armed robbers, numbering six, shot sporadically into the air when they stormed the town to scare the people away before forcing their way into the bank.According to them, five officials of the bank and two customers were killed by the armed robbers though one of the robbers was also shot dead after the intervention of the Nigerian Army. A source said: “The robbers stormed the area at about 2:00p.m. shooting sporadically as they blew open the bank security door with dynamite. During the operation that lasted about one hour, seven persons including bankers, a police inspector and two customers using the ATM were shot dead. “Also, five persons with severe injuries are now on danger list at the General Hospital Idoani,” he said, adding that some of the bandits escaped with an unspecified amount of money before the arrival of soldiers.Another source said haven got the information about the robbery, a combined team of policemen and soldiers stormed the scene and engaged the hoodlums in a gun duel. He added that some of the robbers went away with gunshot injuries. “The attack has claimed the lives of some bankers and customers at the ATM point, while some were left injured. Two bankers have been confirmed dead already. 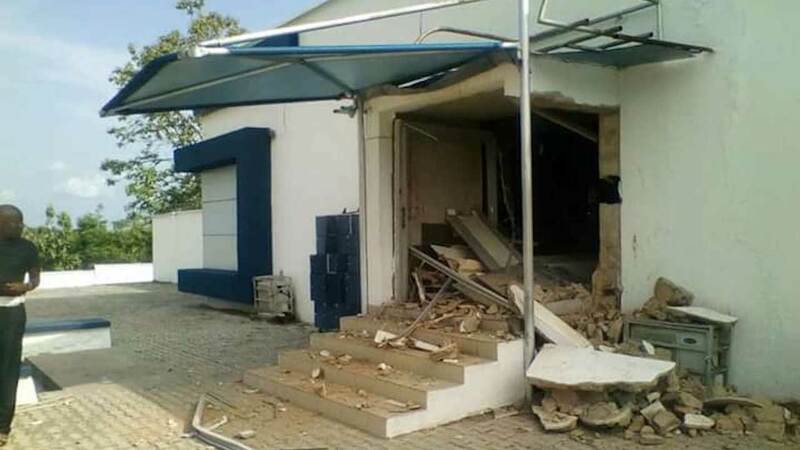 Four persons using the ATM have been confirmed dead too,” he said.The state Police Public Relations Officer (PPRO), Mr. Femi Joseph, who confirmed the incident, said he could not give details as at press time. “I can confirm it but I can’t give the details now but the Commissioner of Police is already on the way to the scene,” he stated.